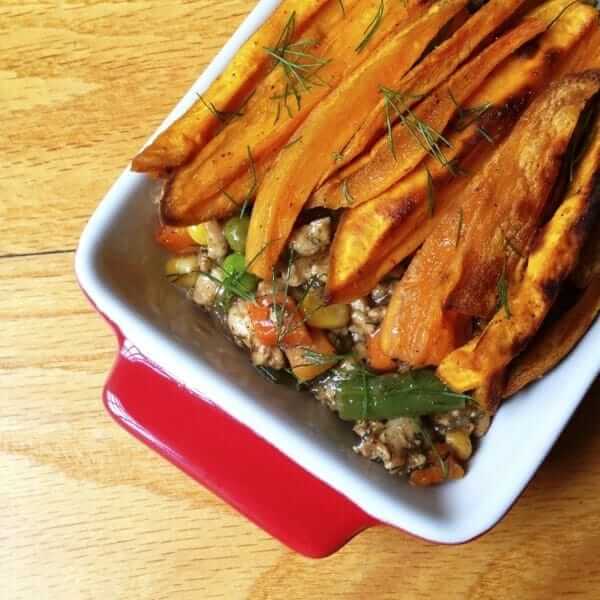 Ground turkey and vegetables combine with fresh dill before being topped with sweet and salty sweet potato fries. Comfort food season is in full effect, my friends. Here in my neck of the woods, the snow is falling and the ground covered in a beautiful, sparkly Winter wonderland. It literally looks like a snow globe outside my window and I couldn’t be happier. When it comes to classic comfort dishes, I am all about using healthier ingredients to hit all of the flavor and texture notes we crave from food. 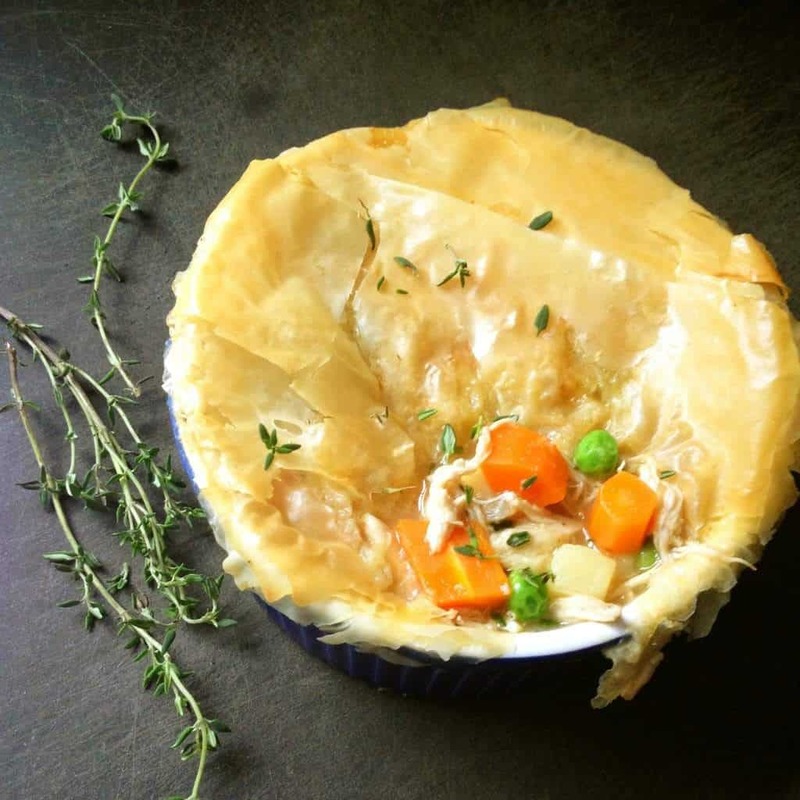 Instead of a butter-filled pie crust, I top my Lighter (Dairy Free) Chicken Pot Pie with light and flaky phyllo dough. Cauliflower is pureed with sharp parmigiano reggiano cheese and spicy dijon mustard in my decadent Creamy Mac and Cheese with Cauliflower. 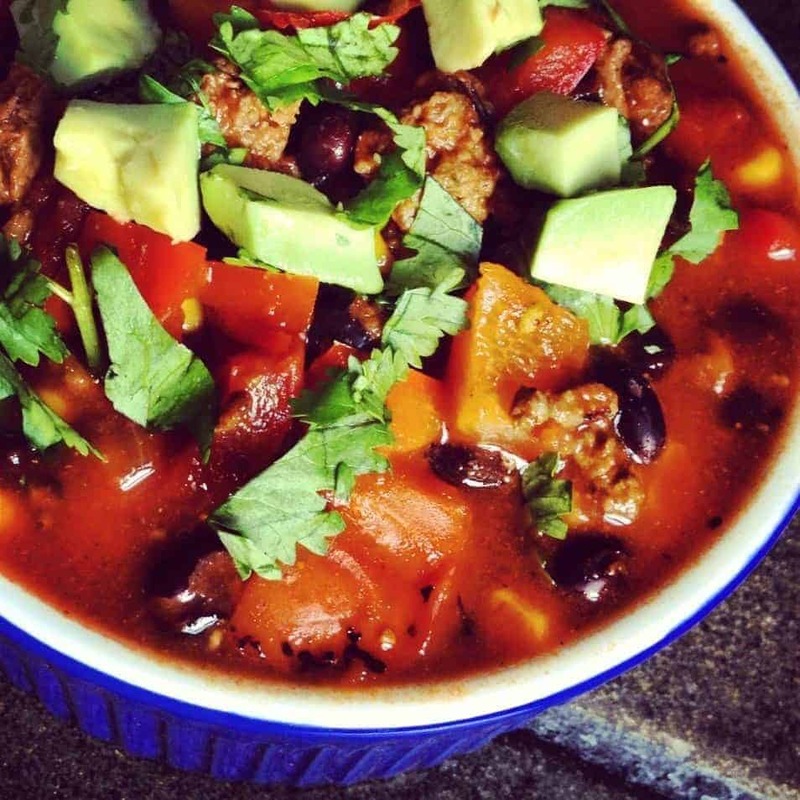 And when it comes to chili, I love topping it with avocado and cilantro instead of sour cream and frito chips. Not only will your swimsuit thank you come Spring but your body will feel energized and happy after the meal, not weighed down begging to be hidden in a giant sweater. Although I’m all for giant sweaters and leggings this time of year. Just sayin’. 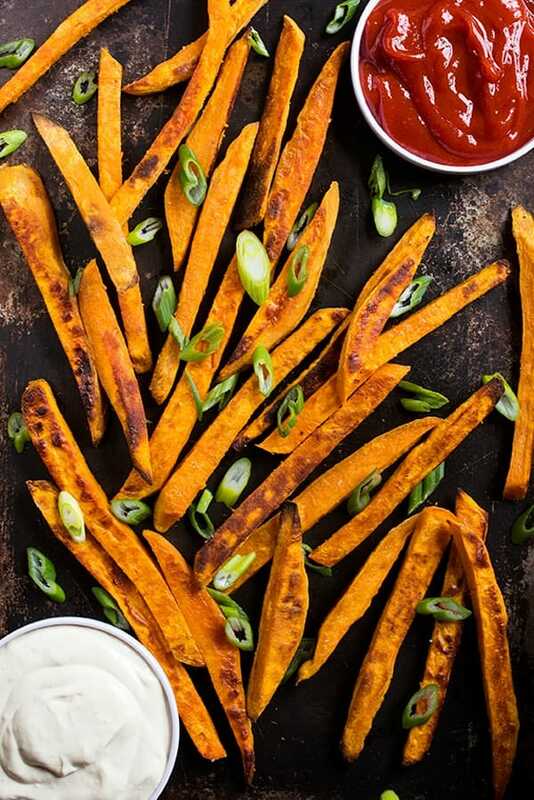 Prepare Rosemary Sweet Potato Fries and bake for 30 minutes or until crispy. While fries are baking, heat deep sauce pan over medium-high heat and add ground turkey. Use a potato masher to break down the turkey a bit then add diced onions, grated garlic, salt, pepper and carrots. Stir turkey and vegetable mixture frequently with wooden spoon until turkey is cooked through and veggies are soft, about 10-12 minutes. When turkey starts to become golden brown and delicious, add flour and cook for 30 seconds stirring frequently. Add chicken broth to the pan and use wooden spoon to scrape up browned bits from bottom. Stir in frozen vegetables then bring mixture to a boil. Reduce heat to low and simmer 5-10 minutes. Stir every minute or check the thickness of the gravy. Feel free to add more broth if sauce is too thick. When the sweet potato fries are hot and ready, add fresh dill to the turkey mixture. Check for seasoning and add salt or pepper if necessary. Serve sweet potatoes on top of the turkey mixture to create Shepherd's Pie or simply serve side by side. Serving size may vary based on size of sweet potato fries. In general, aim to divide total mixture by four to determine serving for one. Comfort food is always a good way to warm up during the cold weather. Thanks for sharing. I love love love that snowglobe! So adorable! 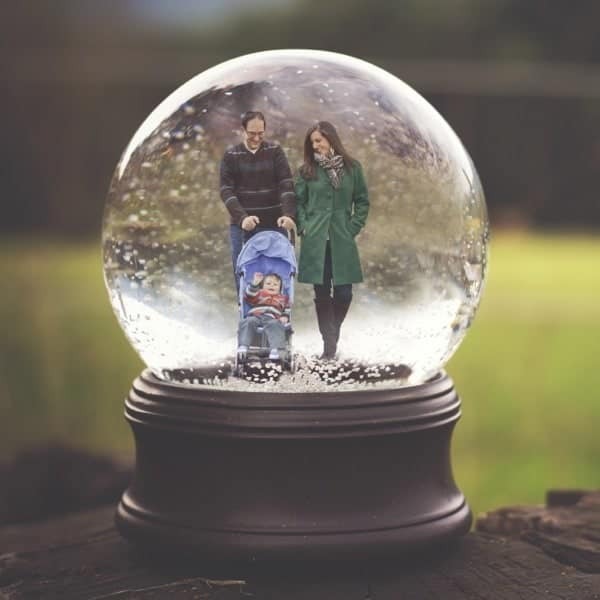 That picture of y’all in the snow globe is absolutely precious! How did you make it?! And I’ve been craving sweet potato shepherd’s pie, but I’ve only seen it with mashed sweet potatoes before- great twist! Thank you so much!!! Our photographer did it – I have no idea how but I’m guessing it was some photo shop thing?? He is so cool and talented!! Love the idea of using sweet potato fries as a topping for shepherd’s pie! I love that snow globe photo! And that sweet potato topping is so perfect. deeeeelicious looking! I’ve never thought to top Shepherd’s pie with anything other than mashed potatoes, but I can easily see how this would totally work and taste amazing. We love doing various toppings. Another tasty one was butternut squash and parsnips – super tasty!!! Let me know if you try this! Oh I love that snowglobe! It looks like it came straight out of a scene from a movie! 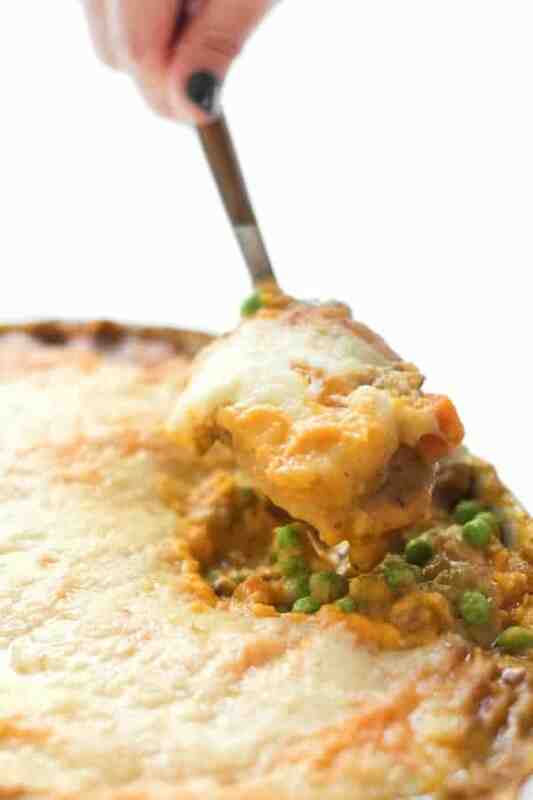 And this shepherds pie… love this idea. I have some leftover ground turkey in the freezer… might just have to use it to make this! Aww thank you!!! Our photographer is super talented!! Let me know if you give this a try – it’s definitely up your alley! I’m so glad to hear!! I love anything phyllo. Oh I’m so glad you liked the pot pie!!! I’ve been craving it again! I love a good sweet potato…anything!! Girl you need to get out of my head! I have shepherd’s topped with mashed sweet potato on my to make list for this week. Love that you used sweet potato fries though! No way!!! Great minds think alike!! Too funny. :) I don’t want to get out of your head! Sweet potatoes! Duh! Why didn’t I think of that?! For some reason, we never have white potatoes in the house (never did growing up either) but I always crave shepherd’s pie in the Winter!! Mmm so many healthy tips! This looks delicious as always. 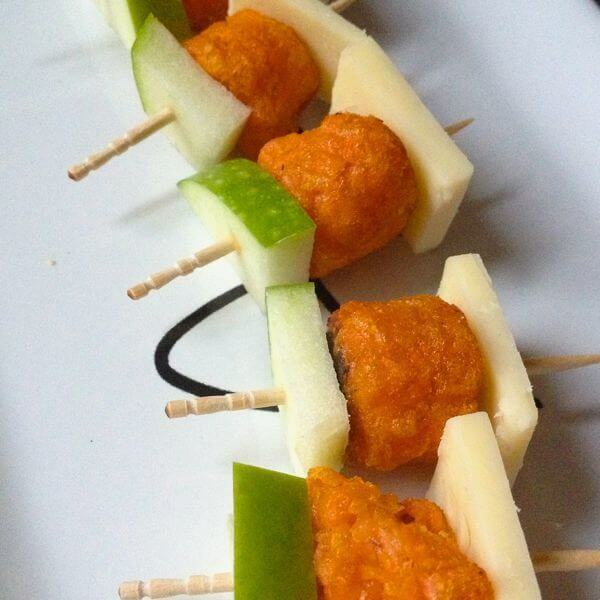 Oh what – what a brilliant idea to top with Sweet Potato Fries! Loving this recipe. Thanks Kristen!!! It was a huge hit – the fresh dill really adds so much flavor! yum. looks so hearty while still being healthy – I’ll definitely be trying this! Love this idea!! Sweet potato fries on top?? Perfect! I’m so glad you don’t think I’m a lunatic for doing that!! For a minute I thought I had lost my mind. I have been craving shepherd’s pie and I’m all for a sweet potato topping. Brilliant, girl! Using sweet potato fries for a shepherd’s pie topping is absolutely brilliant! And I love that snowglobe photo.